Prayers for your family--that's certainly a lot to handle at once. I'll check my stash--I'm pretty sure I have yarn in those colors. I will pm for your address. I will be glad to help. Lots of prayers and hugs for you and your family. Sopo, wow, what a lot to have thrown at you! So sorry. I have pink yarn and will do what I can. Thank y'all. Sure appreciate it. My heart just hurts for her. Just put 2 squares in the mail. i will see what I can do as well sopo. I just re-read this after I already started a purple square. I'm sorry it's not a light purple....hope it can be used anyway? My heart is just breaking for you and your family. Prayers and good intentions are being sent up for you all. I'm not sure what I have for purple (I can't believe that!) at this time, but I'm pretty sure that I have light pink. I will check my stash and make what I can. I'll pm for your address. Thank you all so much. Kitty that is fine. I have two squares done in pink and a third almost done (pink also). I'll try to get them in the mail asap!! Thank you Tampa Doll for the 2 squares. They are purple but I haven't been able to pick up purples very well with this camera for some reason. I really appreciate them and the card. Thank you to greyhoundgrandma for 3 beautiful squares. So appreciated. Thank you to all of you for taking the time to help with this. sopo, how many more do you need. I am making a 12inch in lavendar varigated, will that be ok.
Not sure yet as they are just coming in. I've got 5 so far and some others are in the mail. Variegated will be fine. I know she'll love all of them. I'll have to dig around my stash, but pretty sure I have some pink and may have some lavender. Let me knew how many more you need. ok, ill finish it up then this weekend, and get it out to you on Monday Sopo.. what a thoughtful thing to do for her too! 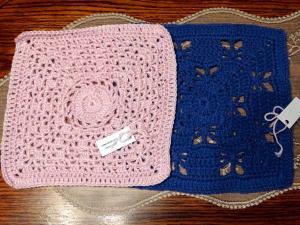 sopo, I have 3 pink squares done. 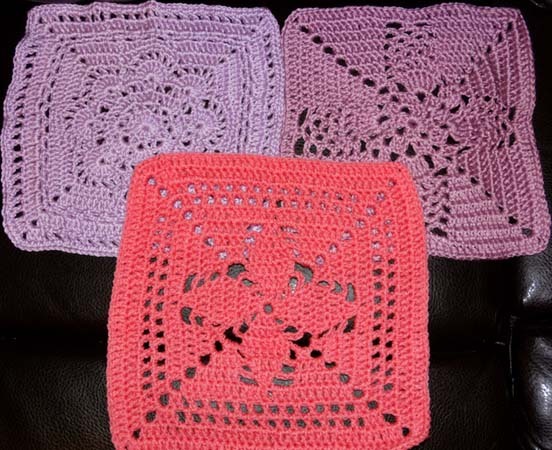 they are basic granny squares. I plan to put them in the mail Monday. Oops, I forgot to say how much I like the other squares already posted! Very pretty! I received 2 more puffies today. 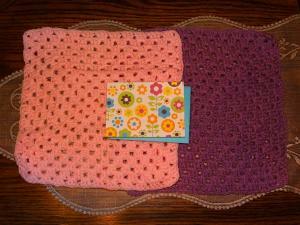 Thank you cshort and kittyloverdeb for the beautiful squares. I truly appreciate them. ETA: I have yet to figure out this camera. The color is somewhat off. Sorry about that. As for purple I have trouble with my camera also, it does not like it, so it makes Purple either black or blue. Go figure. 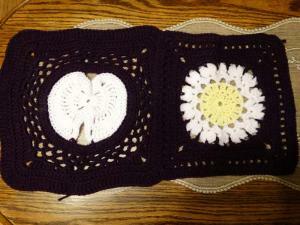 You are getting some very pretty squares. I put 3 squares in the mail to you today. You should get them Thursday. 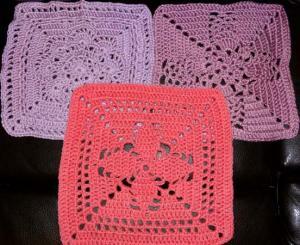 I received three lovely squares from grannyannie today. Thank you so much! That brings my total i have here to 12 and with the ones that are on their way.... I am getting close to having enough. A huge heartfelt thank you to everyone for helping me with this. 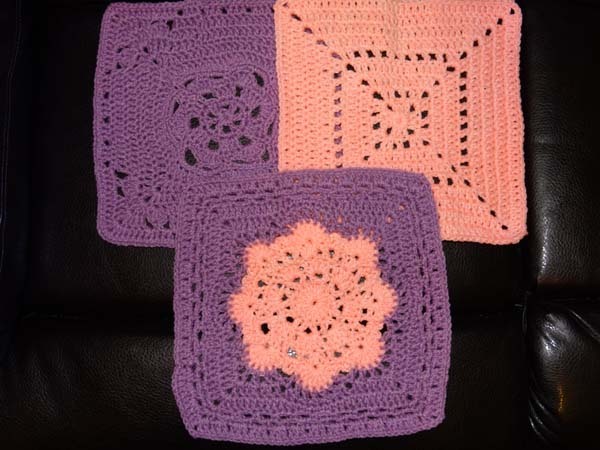 Pretty squares. I have two ready to mail. I should make it to the PO hopefully by Fri.